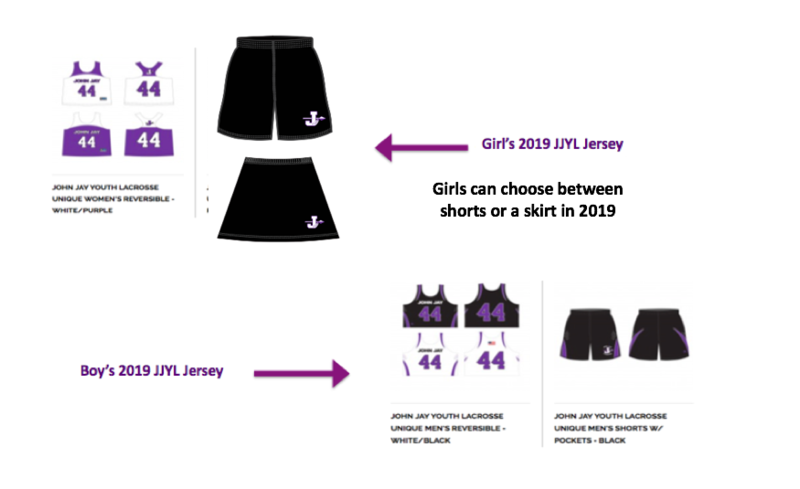 JJYL introduced a new approach to uniforms in 2018, after a successful pilot in the girls program in 2017. We will continue this approach for the 2019 season. Instead of ordering new uniforms each year and building that cost into registration, we have locked in on a uniform style and all existing players have the option of keeping their uniform from prior years (2017 or 2018), or they can order a new uniform separate from the registration fee. If your son played last season, they can continue to use their 2018 uniform or order a new one in 2019. If you do not order by February 15, you may not have a jersey for the 2019 Spring Season. If your daughter played last season (grades 3-7th) or prior, they can continue to use their 2017 or 2018 uniform or order a new one in 2019 (jersey, shorts or skirt, or all 3). Note: We are adding a skirt option for girls for first time in 2019. All new players -- excluding grades K-2 -- will be required to purchase a JJYL reversible purple and white jersey and JJYL shorts. Returning players now entering 3rd grade will also be required to purchase a JJYL reversible purple and white jersey ($33 each) but can use the shorts they have from 2nd grade if they still fit. If you do not order by February 15, you will not have a jersey for the 2019 Spring Season. This new uniform program removes the burden of paying for a new jersey set each year, allowing for reuse and reducing overall costs for our JJYL families. JJYL is not involved in the transactions and is simply creating this group as a service to our members.